To the south of Madaba, the road to Kerak winds down into and up out of the awe inspiring Wadi Mujib, along the Mobaite ridge. 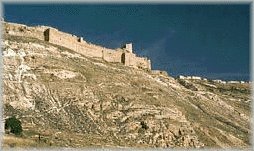 Kerak is distinguished by its fine crusader castle built in the 12th century on the remains of earlier citadels, which date back to Nabataean times. There is a small but interesting museum in the castle, which is one of the finest of its type surviving today.